The Ecobot III robot can eat partially processed sewage and use the nutrients to power itself. 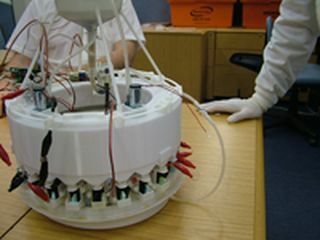 Ecobot III can navigate toward a dispenser when it needs nutrients; the material is broken down by bacteria held in a stack of two tiers, each with 24 microbial fuel cells (MFCs). Undigested matter passes via a gravity feed to a central trough from which it is pumped back into the feeder tanks to be reprocessed in order to extract as much of the available energy as possible. The waste is then purged every 24 hours by a peristaltic pump that works like the colon, using pressure waves to expel the waste from the tube into a litter tray. The bacteria in each MFC metabolize the mixture, producing hydrogen atoms in the process. The hydrogen electrons are drawn to the fuel cell anode where an electric current is generated. Meanwhile the hydrogen ions enter the cathode chamber via a proton-exchange membrane and combine with oxygen in the water in the chamber to produce more water. The robot drinks water to replace losses through evaporation. 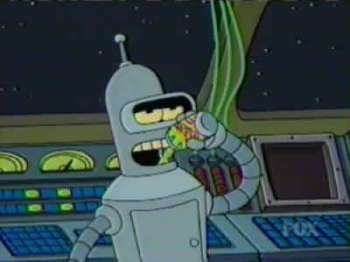 SF fans may have other favorites for organic matter-consuming robots, but I thought about Bender, the humanoid robot in Futurama, who requires an organic beverage for power. Olde Fortran Malt, please, and see what the bots in the back room will have! Read more about an earlier version of Ecobot in my earlier article Flesh-Eating Robot Research Languishing. See also this article about EATR Energetically Autonomous Tactical Robot .